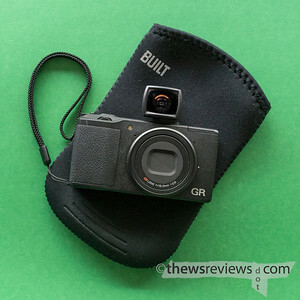 Yeah, but: Of course this is about the Ricoh GR. The Long Version: It's a little odd that I've wanted to buy something made by Built NY for almost a decade, but it took until now to find something that I both needed and would spend the money on. They've made the neoprene rectangle with bulgy corners into something of an icon, and it tends to be priced accordingly. But one recent day I was wandering through the clearance bins of the happiest place on earth – Staples / Business Depot – and found their slim sleeve designed for the Kindle Fire. This will fit any generic 5" tablet, but more importantly, fits a Ricoh GR with an optical viewfinder attached. The sleeve is nicely made, with cushy neoprene, the wetsuit material, and a soft liner. Its shape is designed to catch and hold a tablet, so that they won't slide out accidentally, and it's also quite effective at holding a camera. I dropped my sleeved GR onto a marble sidewalk – viva Las Vegas! – and not only was the camera protected, it didn't move within the sleeve at all. Yet the camera is still easy to remove whenever I want it, even though it's never a one-handed operation with any sleeve that I've used. I almost always carry my small cameras inside of other bags, making a zipperless, flapless, velcroless sleeve the most convenient and lowest-bulk carrying option. 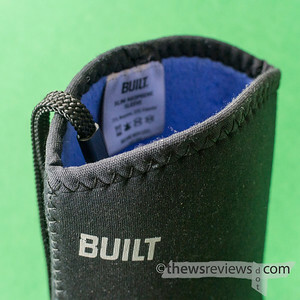 This Built sleeve is at least as protective as the more customary nylon-and-padding compact camera pouch, has nothing that can scratch or make noise, and costs about the same as a good pouch even when it's not on clearance. This 5" size is a good match for larger compact cameras, and would be my choice for the Canon G-series, which is a perennial problem to house. There are smaller models designed for phones that should fit other cameras, too. But there'a a broader lesson here that goes beyond this specific case: us photographers need to get away from photography every now and then. The solutions to the problems that we face, both practical and artistic, may already exist in another genre. And it's worthwhile to browse the clearance bins from time to time. Great idea! I carry a P&S with me everywhere, and they have looked terrible in no time! This would certainly help. (In fact, my G9 had terminal dust bunnies within the lens, and I bet good use of this or a ziploc bag would have prevented that.) Wonder if my local Staples has a clearance bin?